Our lives and specifically the market are so full of random aspects and complex structures. Understanding the behaviour of markets and attributing specific reasons to its behaviour is totally impossible and sometimes a useless task. As the title explains, Taleb’s theory explains how all of us get fooled easily by randomness. Taleb goes on to elaborate how we misconstrue luck and skill. Wherever true luck plays a role, we assume it to be the work of individual skill. Most impressive situations in life are only due to luck, claims Taleb. He uses the theory of black swans (rare events) to propound his idea and says that black swans cannot be predicted. Taleb elucidates his theory through some popular examples using people like the baseball expert Yogi Berra, the philosopher Karl Popper, the ancient wise man Solon, the financier George Soros and the Greek voyager Odysseus. Most of all, journalists and traders fall for the randomness as well. In addition to real-life examples, Taleb also brings in the case of the fictitious hero Nero, who is smart enough to understand the play of randomness in his professional life, but is superstitiously foolish. Taleb also constructs an invincible, nameless fool who seems to be at the right place at the right time. The fool has a steady string of followers who are ready to do anything for their Guru. But, the fool’s actions cannot be imitated. His success is one obtained by chance. The most unexpected things will happen for sure. But, we become creatures of routine that we fail to identify it when it happens. Moreover, detecting risks and accepting them is done only by the emotional part of the brain. If we understand probability, then we can perceive the role of luck in everyday situations. The trick lies in recognizing it. Taleb says we must be aware of the trap that luck sets for us. How do we distinguish a lucky poseur from a far-sighted visionary? How do we read an incident? How do we decide whether it is luck or talent that made the person successful? 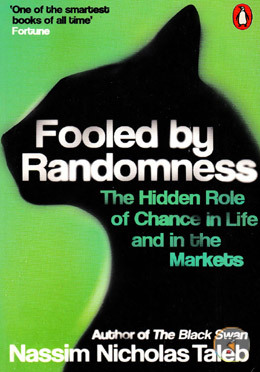 Fooled By Randomness: The Hidden Role Of Chance In The Markets And In Life received wide recognition. Fortune named it as one of the smartest books of all time and the Financial Times termed it as the Book of the Year. Nassim Nicholas Taleb is an essayist, statistician and best-selling author. He is also the author of The Black Swan, The Bed of Procrustes: Philosophical and Practical Aphorisms and Antifragile: Things That Gain from Disorder. Taleb was born in 1960 in Amioun, Lebanon. He graduated from the University of Paris with a Bachelor’s degree in Science and also holds a Master’s degree from the same university. He also has an MBA and Ph.D from Wharton School and the University of Paris respectively. Taleb has taught at London Business School, New York University and presently teaches at Oxford University and the Polytechnic Institute of New York University.